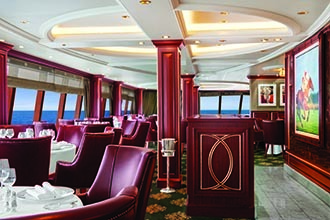 Designed for lovers of fine dining and travel experiences, the sophisticated and elegant 1,250-guest Riviera, sister to Marina, is ideal for the culinary cruiser. 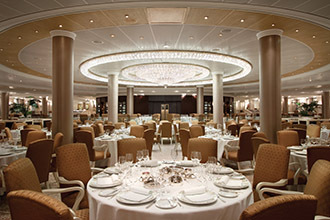 Oceania has been touted as the "foodies" cruise line. She's beautiful with designer touches everywhere, from the Grand Staircase with Lalique crystal to the incredible Owner's Suites styled in Ralph Lauren Home. 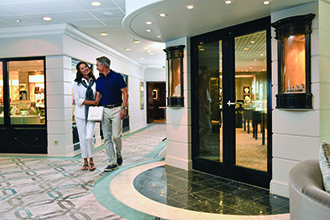 Personifying the Oceania Cruises experience, this midsized ship offers a welcoming country club ambiance with an exceptional level of personalized service. 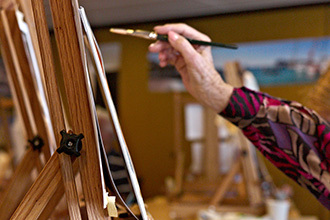 Riviera features multiple dining venues, six of which are open seating gourmet restaurants with no surcharge and exquisite cuisine, inspired by legendary Master Chef Jacques Pépin. Additionally, she features The Culinary Center, an amazing hands-on cooking school and La Reserve by Wine Spectator, for an incredible wine and food pairing experience. 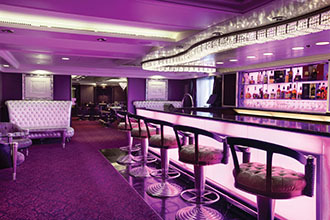 Visit the Artists Loft, for instruction in fine arts; Baristas Coffee Bar and lots of relaxing intimate lounges, including Martinis, serving the famous cocktails in a gentleman's club-like atmosphere. This gorgeous mid-sized ship seamlessly blends sophistication with exciting innovation. 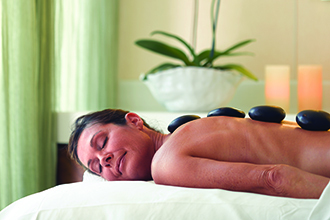 All of the amenities to inspire your perfect vacation are available including luxurious suites and staterooms, a heated pool, whirlpools, refreshing treatments at the world-famous Canyon Ranch SpaClub®, Duty-Free shopping at the Boutiques, and an English-style Library for books and board games. The Oceania@Sea Internet Center, open 24-hours, is the perfect spot to share your delightful journey with family and friends back home and WiFi access is also available. 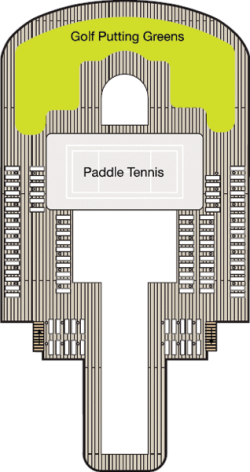 The fresh sea air provides the back drop for a game of paddle tennis or a jog around the track on deck. Guest lecturers provide engaging and entertaining presentations on a variety of intriguing subjects. 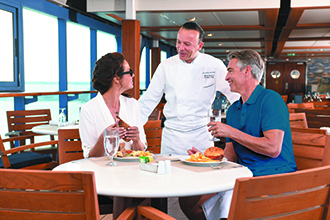 Savor some of the finest cuisine at sea, prepared à la minute, as your taste buds take an amazing culinary journey. French-inspired Continental cuisine is featured at the elegant Grand Dining Room under the glow of a stunning crystal chandelier. Toscana Italian restaurant serves authentic Tuscan dishes and famous wines from this region. For a traditional steakhouse, Polo Grill is your destination du jour. Jacques Pépin's dining venue, "Jacques," designed with antiques, showcases the crème de la crème of classic French cuisine. 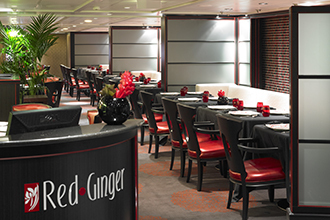 Red Ginger's feng shui influence ensures that the delicious contemporary Asian classics on which you dine are enjoyed in a relaxed and peaceful setting. For a casual meal visit the Terrace Café, for diverse and decadent buffet selections and Waves Grill. Special culinary evening events are offered at Privée and La Reserve by Wine Spectator for an amazing gourmet dining experience. 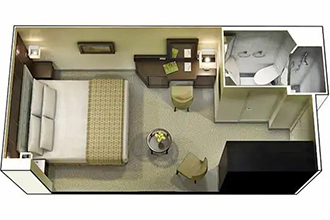 Luxuriate in spacious and beautiful staterooms and suites. Your private veranda is the perfect place to enjoy a romantic sunset or sailing away from a beautiful port of call. Palatial Owner's Suites, Vista Suites and Oceania Suites elevate cruise ship opulence to new levels, boasting designs from Ralph Lauren Home and Dakota Jackson. The amazing Tranquility Bed in your stunning home away from home ensures you wake up rested for the next day's adventures. 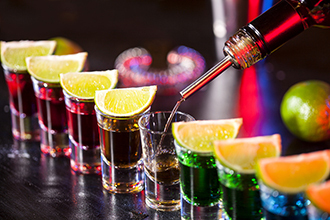 Entertainment includes evenings of jazz, disco and dancing at Martinis, performances by magicians, comedians and headliners. 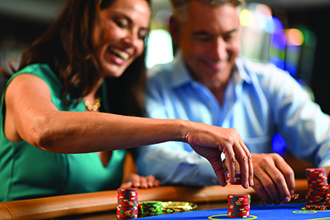 Try your luck at blackjack, poker, roulette or on the exciting slot machines in the Monte Carlo-style casino. Sample a rare vintage at the Grand Bar, ideal for pre-dinner drinks or catching up with friends. 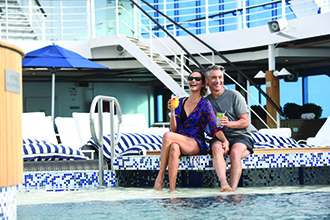 Cruise on the beautiful Riviera to worldwide destinations, including the Bahamas, Caribbean, Greece/Turkey/Black Sea and Europe, Mediterranean, Transatlantic & Repositioning voyages. 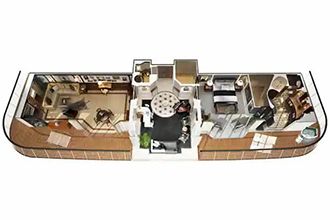 (282 sq.ft.) These beautifully decorated 282-square-foot staterooms reflect many of the luxurious amenities found in our Penthouse Suites, including a private veranda, plush seating area, refrigerated minibar and an oversized marble and granite-clad bathroom with a full-size bathtub/shower and separate shower. Guests also enjoy access to the private Concierge Lounge featuring your own dedicated Concierge, magazines, daily newspapers, complimentary beverage and snacks.Additional Amenities: Queen-size Prestige Tranquility Bed, an Oceania Cruises Exclusive, with 1,000-thread-count linens; Priority noon ship embarkation with priority luggage delivery; Exclusive card-only access to private Concierge Lounge staffed by a dedicated Concierge. 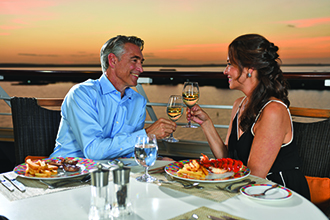 Priority online specialty restaurant and shore excursion reservations. 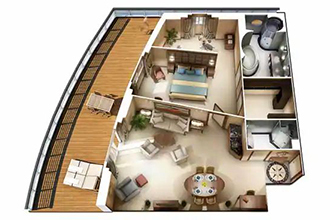 (282 sq.ft.) 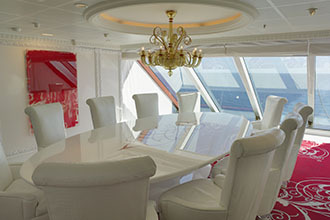 As their name implies, Veranda Staterooms feature a private veranda, our most requested luxury. Besides offering an abundance of space, each of these 282-square-foot staterooms includes a plush seating area, refrigerated mini-bar, spacious closet and a marble and granite-clad bathroom with bathtub/shower and separate shower.Additional Amenities: Queen-size Prestige Tranquility Bed, an Oceania Cruises Exclusive, with 1,000-thread-count linens; Twice-daily maid service; Full-size bathtub; Signature Belgian chocolates with nightly turndown service; Flat-screen television with live satellite news and programming; DVD player with extensive 24-hour room service menu; Wireless internet access; 110/220 volt outlets; Direct-dial satellite phone and cellular service; Writing desk and stationery; Security safe; Handheld hair dryer; Thick cotton robes and slippers; Plush cotton towels. These comfortable 242-square-foot staterooms with floor-to-ceiling panoramic windows feel even more spacious with the curtains drawn back and the ocean in full view. Features include a generous seating area, vanity desk, breakfast table, refrigerated mini-bar and a marble and granite-clad bathroom with a bathtub/shower and separate shower.Deluxe Ocean View Stateroom Amenities, Prestige Tranquility Bed, an Oceania Cruises Exclusive, with 1,000-thread-count linens, Refrigerated mini-bar with free and unlimited soft drinks and bottled water replenished daily , Full-size bathtub,Bulgari amenities, Handheld hair dryer, Flat-screen television with DVD player and extensive media library, Wireless internet access. (174 sq.ft.) Wonderful sanctuaries unto their own, these 174-square-foot staterooms boast beautiful designs and handsome furnishings that add to the serenity. Highlights include a spacious marble and granite-clad bathroom with a shower, as well as thoughtful touches such as a vanity desk, breakfast table and refrigerated mini-bar.Additional Amenities: Queen-size Prestige Tranquility Bed, an Oceania Cruises Exclusive, with 1,000-thread-count linens; Bulgari toiletries; Twice-daily maid service; Full-size bathtub; Signature Belgian chocolates with nightly turndown service; Flat-screen television with live satellite news and programming; DVD player with extensive 24-hour room service menu; Wireless internet access; 110/220 volt outlets; Direct-dial satellite phone and cellular service; Writing desk and stationery; Security safe; Handheld hair dryer; Thick cotton robes and slippers; Plush cotton towels. (1000 sq.ft.) Conceived by the famed New York designer Dakota Jackson, each of the twelve Oceania Suites sprawls over more than 1,000 square feet of luxury. 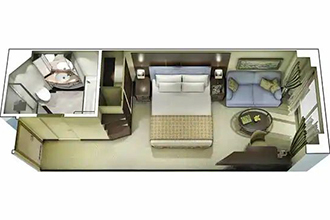 Situated in an ideal location high atop the ship, these suites feature a living room, dining room, fully equipped media room, large walk-in closet, expansive private veranda, indoor and outdoor whirlpool spas and a second bathroom for guests. Also included is exclusive card-only access to the private Executive Lounge.Additional Amenities: King-size Prestige Tranquility Bed, an Oceania Cruises Exclusive, with 1,000-thread-count linens; Priority noon ship embarkation with priority luggage delivery; Exclusive card-only access to private Executive Lounge staffed by a dedicated Concierge. 24-hour Butler service; Priority online specialty restaurant and shore excursion reservations; Bulgari gift set and toiletries; Choice of daily printed newspaper; Customized entertainment system with integrated sound system and media library. (2000 sq.ft.) 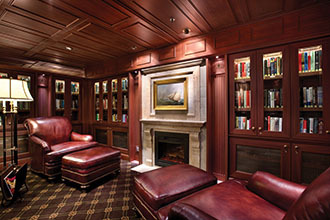 With rich furnishings from the Ralph Lauren Home Collection, each of the three Owner's Suites measures more than 2,000 square feet and spans the entire beam of the ship, boasting a large living room, two walk-in closets, indoor and outdoor whirlpool spas, dramatic entry foyer, a second bathroom for guests and music room with piano. These suites also include exclusive card-only access to the private Executive Lounge.Additional Amenities: King-size Prestige Tranquility Bed, an Oceania Cruises Exclusive, with 1,000-thread-count linens; Priority noon ship embarkation with priority luggage delivery; Exclusive card-only access to private Executive Lounge staffed by a dedicated Concierge. 24-hour Butler service; Priority online specialty restaurant and shore excursion reservations; Bulgari gift set and toiletries; Choice of daily printed newspaper; Customized entertainment system with integrated sound system and media library. (420 sq.ft.) The elegant Penthouse Suites rival any world-class five-star hotel for comfort and beauty. 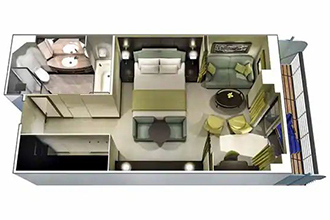 Their design is ingenious, maximizing the generous 420 square feet of space and featuring a dining table, separate seating area, full-size bathtub/shower and separate shower, walk-in closet and private veranda. 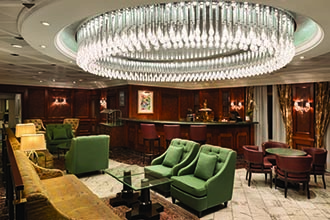 Enjoy exclusive card-only access to the private Executive Lounge and the services of a dedicated Concierge.Additional Amenities: Queen-size Prestige Tranquility Bed; Noon ship embarkation; Exclusive card-only access to private Executive Lounge staffed by a dedicated Concierge. 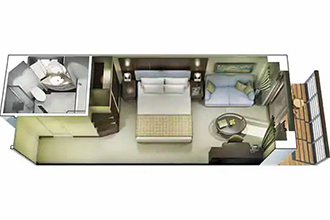 Priority online specialty restaurant and shore excursion reservations; Exclusive discounts on Internet usage plans; Bulgari toiletries; Customized entertainment system with integrated sound system and media library. (1200 sq.ft.) 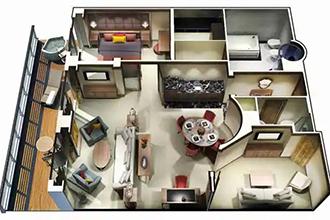 Given their lavish interior design by Dakota Jackson and premier location overlooking the bow of the ship, the eight Vista Suites are in high demand. These 1,200- to 1,500-square-foot suites (size depends on desk location) include access to the exclusive Executive Lounge as well as every imaginable amenity, such as a large walk-in closet, a second bathroom for guests, indoor and outdoor whirlpool spas and your own private fitness room.Additional Amenities: King-size Prestige Tranquility Bed, an Oceania Cruises Exclusive, with 1,000-thread-count linens; Priority noon ship embarkation with priority luggage delivery; Exclusive card-only access to private Executive Lounge staffed by a dedicated Concierge. 24-hour Butler service; Priority online specialty restaurant and shore excursion reservations; Bulgari gift set and toiletries; Choice of daily printed newspaper; Customized entertainment system with integrated sound system and media library. 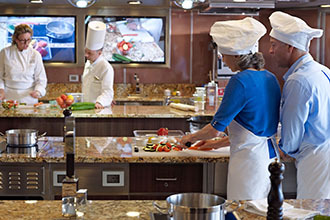 Immerse yourself in the joy of cooking gourmet cuisine at Oceania Cruises' Bon Appétit Culinary Center. It's the world's only hands-on culinary studio at sea, a distinction that elevates the onboard gourmand experience to a level of participation far beyond even the grandest expectations. Fitness TrackHandsomely decorated in rich woods, designer tapestry fabrics and oversized armchairs, the expansive dining area exudes classic splendor. The Grand Dining Room’s formally attired and classically trained wait staff graciously serve course after course of European-inspired cuisine or delectable alternatives such as light and healthy Canyon Ranch Spa Cuisine and gourmet vegan options. As variety is essential, menus change daily with a brilliant choice of at least ten appetizers, soups and salads and twelve entrées at dinner. 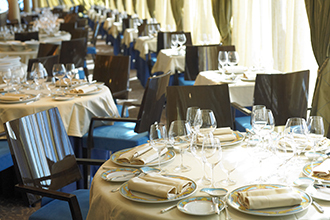 Privée stands alone as Oceania Cruises' most indulgent, one-of-a-kind dining experience. Beautiful scenes of the fertile Tuscan countryside adorn Toscana, an artistic expression of the authentic dining experience awaiting guests. Sometimes, the ultimate luxury is casual dining on all-American favorites, a style laid-back Waves Grill epitomizes. Located in a spacious, shaded area steps from the swimming pool, Waves Grill offers an extensive and mouthwatering luncheon menu as well as vegan smoothies during breakfast at the Smoothie Bar. During lunch, the chefs grill gourmet burgers, tangy barbecue and succulent seafood to order in the open galley, accompanying them with side dishes like garden-fresh salads and crispy, hand-cut truffle fries dusted with grated aged parmesan.